If you stand still long enough anywhere on the red soil of Kigali, you may be able to sense a slight shift in the ground, rumbling under your feet. Deep in the mantle of the planet, upwelling magma shoots to the surface and rips open the skin of the earth. A 6,400-kilometre fissure, the Great Rift Valley, stretching from Jordan to Mozambique, carved up the continent of Africa and spawned the Great Lakes. Every year, 500 million birds use it as their flight path, and 100,000 years ago it was one of the first highways of human migration. Patched into a quilt of Central African countries, Rwanda bottoms out onto one of the rift’s offspring—the great Lake Kivu. From the air the country looks like a series of landscapes by Paul Klee—mountains, lakes, and valleys in geometric patterns of irregular squares, dusted terracotta red. The green has a tropical juiciness to it and the red soil a deceptively fertile glow. Kigali, the capital, is in almost the dead centre of the country. Wrapped into a mountain at its highest point of 1,600 metres, it is built into the natural fabric of the land. Scores of dwellings pop out like blisters from the belly of the wide central valley and creep onto the sides of the hill. People spend their days navigating the big up and down of unmapped, wormy neighbourhoods, carrying water jugs on their heads, produce in their hands, and children on their backs. From the safety of some of the ridges that sweep across the city, you can stand and watch the exhausting, pornographic industry of poverty. Driving in from the airport, I am immediately struck by the number of people walking by the sides of the highway. Some are dressed for the office, some in traditional outfits, but most are in bare feet. They walk in the fog of a thick sun and the constant clicking dialogue of jackdaw ravens. My eye catches episodes of ordinary flowers—poinsettias, geraniums—suddenly stunning in their original home. The few sidewalks are less than a year old. Thanks to a recent partnership with the Chinese, who have also been supplying the country with bicycles, some of the roads are now paved. But most of them are still raw and ungraded, flanked by the natural tears from their construction. Long, haphazard roots spill out onto the shoulder like delinquent strands of hair. As we drive by groups of schoolgirls in shock-blue uniforms and regulation shaven heads, I wonder whether it is the heat or their legacy that has stolen a few rounds from their mulberry bush or taken some of the singsong out of their skip. And as the car careens into the deep sway-back of the city, I also wonder if there is a quarter of a mile of straight road anywhere in the country. Still, there are paragraphs of comfort in Kigali, and I am about to step into one of them. The Hôtel des Mille Collines (a thousand hills), famous now because of the film Hotel Rwanda, is one of the oldest luxury hotels in the city. It is hosting my stay as I track the activities of Canadian concert pianist and University of British Columbia professor Rena Sharon on her return visit to Kigali. Inspired by a passionate plea from Roméo Dallaire, who called not for soldiers but an army of artists, teachers, and caregivers to flood the country, and driven by a strong social conscience, a year earlier Sharon dipped into her savings, flew to Kigali for a week, and offered her considerable gifts as performer and teacher to the Rwandan public. She was moved by her experience of playing for an audience who responded to the music as though from the composer’s source, laughing out loud when the music took an unexpected turn. The experience was so different from the foot-tapping restlessness of her usual audiences that it changed the nature of her performance. And she was profoundly altered by the moral ambiguity of her northern privilege. 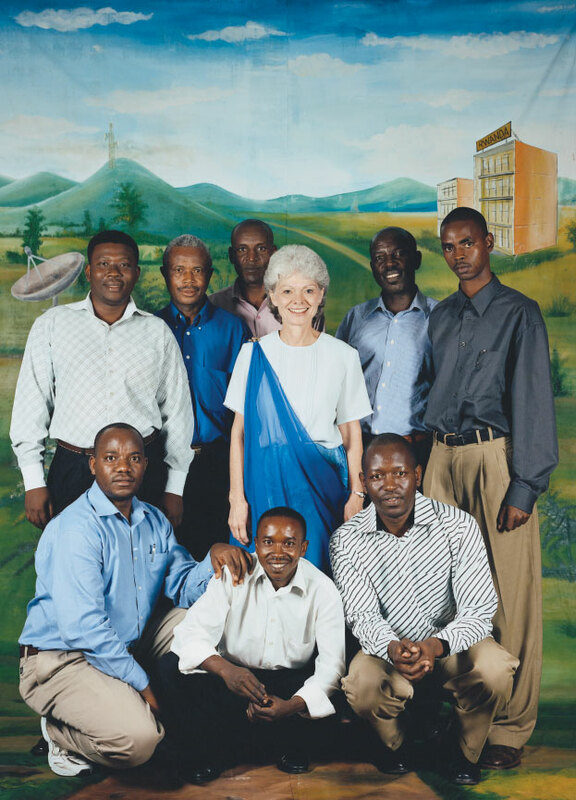 When the invitation to return to Kigali from the Canadian consul arrived, she scraped together the funds and bought another ticket. She plans to set up a foundation for teaching internships and a cross-cultural music festival. Sharon is in such demand during her two weeks here that her visit had to be organized into a daily schedule of teaching, interviews, and concerts. Musician Kirusu Tomasi holding the inanga. I came to Rwanda to follow Sharon’s project, which includes playing for orphanages, hospitals, and the university, and found myself in a country where the culture has been locked in a deep-freeze for twelve years. Since the war, the soul of the nation has been choked in silence, many of its artists literally and figuratively no longer able to speak. This is not only a psychological and emotional expression of trauma; it is also because the population of artists has been significantly reduced. In the 1920s, after a history of intermarriage between the two dominant tribes of Rwanda, the Hutus and the Tutsis, the Belgian colonial rulers racialized the country, classifying people according to the number of cows they had—those with more than ten were Tutsi, less than ten, Hutu. By the 1990s, three decades after independence, the thriving, integrated community of artists had lost respect for those arbitrary designations. When the war broke out, they were targeted as sympathizers and many were killed immediately. Others fled the country. In the last five years, the population of Kigali has increased to close to a million, and some of that migration includes the return of the surviving artistic community. It is not an easy homecoming. Corneille Nyungura, for example, who is a megastar in the francophone world and has an international reputation, moved to Montreal after a harrowing escape from the genocide. He still cannot go back. For the rest, the steps home are hesitant but there is a new openness to the outside world and a growing appetite for Western culture and expertise. 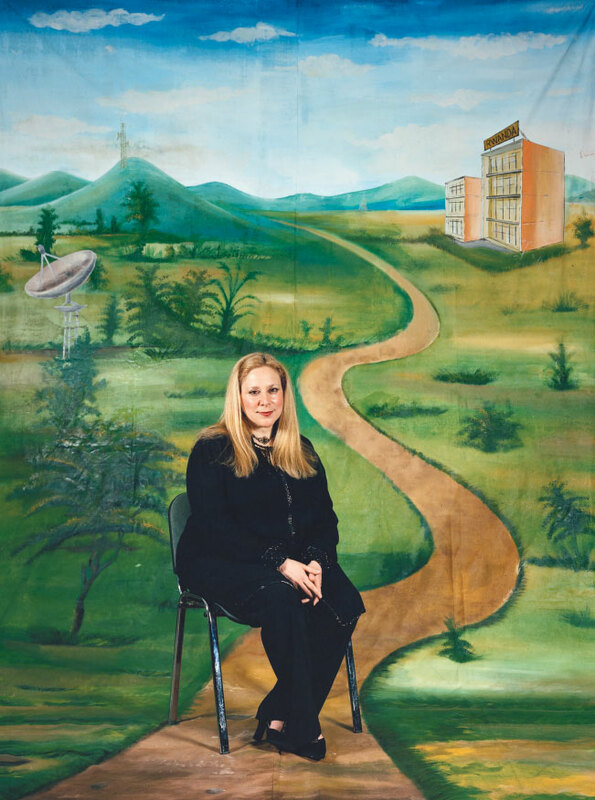 Sharon’s project is part of a thaw in the voice of the people. Albert Byron, a guitarist, was one of the first artists to return after the war. He has been trying to resuscitate the local culture, but while I was in Kigali I couldn’t find a single club with live music or a pocket of alternative artists. Most of the music heard today is imported from the Democratic Republic of the Congo or South Africa. I also couldn’t find a McDonald’s, which is more significant than it sounds, because I discovered that the absence of images from corporate America has a dramatic affect on the psyche. Under the spell of the Rwandan sun, a sun that climbs a horizon of unimaginable expanse, I felt, for the first time in a long while, a stretch along my own borders and as un-invented as the landscape. The Hôtel des Mille Collines, in the heart of the most affluent district in Kigali, has an easy andante to it, a Sunday-drive feel. I am greeted by a gracious, disproportionately large staff in a lobby that holds the footprints of Bill Clinton and the king of Belgium but also the hundreds and hundreds of desperates who in 1994 crammed into the cane-backed cushions of the sofas and stuffed the balconied rooms of the five-storey hotel. This address was UN-protected during the genocide, a safe haven, and is one of the only buildings in Kigali that remained intact. But the taste of aftermath is oddly absent here, and like so much else in the city except for the reminders from the limbless, the surface stains of recent history have been wiped over. Just around the corner from the president’s quarters and very near the new Intercontinental, the only hotel that has the really familiar swell of luxury, there is a pause in the studied elegance of the Boulevard de la Révolution. The Central University Hospital of Kigali, a facility that serves the general population and has an AIDS unit, is designed like a military compound. Next to the dressy architectural splash of the street, it’s an old, torn pocket. Inside the grounds of the hospital, on a lawn that fronts a series of concrete buildings for the “surgeree” or “famille” clinics, dozens of patients in vivid stages of illness roam around, waiting. A mephitic odour, escaped from the wards, infuses the outside air. After meeting with the director of the hospital and discussing the current research on the somatic benefits of music for the sick and dying, Sharon is going to play a short concert. 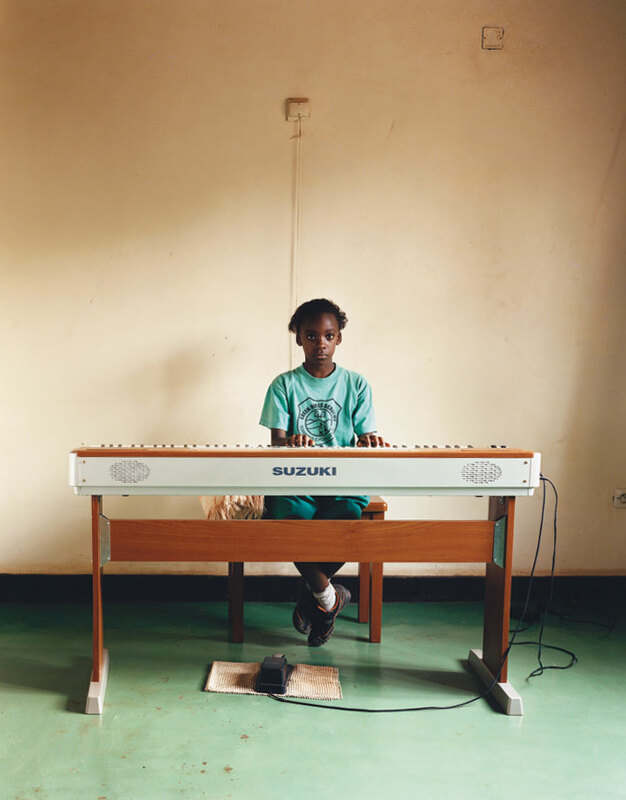 We unload the electronic keyboard, an instrument she carts around to many of her performances, and carry it into one of the clinics. A young man, healthy-looking, possibly an employee, follows us and finds one of the few outlets along the long, narrow hallway. There are no individual rooms in this ward. Patients are kept everywhere and anywhere—some two to a bed, hooked up to IVs, some bandaged and sitting or slung facing the stains on the unpainted walls. Others wander aimlessly, negotiating the buckets and basins on the floor. Conservatory director Marlene Lee with students. Sharon and I enter the Mille Collines and walk downstairs to the poolside bar, which sings Graham Greene—a kind of 1950s Hollywood glamour in retirement, little thrills of danger sewn in the undertones. There are the prostitutes, the spies, the distinguished academics, the indistinguishable academics, the middle-aged hausfraus with unfortunate eyebrow-plucking decisions, the divorced, tattooed, Nebraskan engineers on suspiciously long-term irrigation projects, the pot-bellied businessmen in Hawaiian shirts, their expensive wives. There are the stingy crusts of old money, the cool, boozed-up film crews, the designer-clothed gorilla seekers, and then there is one actual, all-dressed witch. I know she’s a witch because her eyes swim like goldfish and she spits at everything young and beautiful in the room. She provokes me when I pass by her with such a powerful grab of my arm that it sends me scared. I wipe the sweat of her spell off my elbow and cast my own little demon in her direction. She recoils immediately. Marlene Lee, the founder and director of this, the only conservatory in the country, is an American-born vocalist and choral director who has lived in Rwanda for twenty-seven years. She is now close to retirement and, unlike many ex-pats, speaks Kinyarwanda. Petite and elegant, in the mould of 1950s movie stars like Donna Reed, she has an evangelical zeal and has been teaching music to the local population for many years. She opened the conservatory a few years ago and today has a growing student body of over a hundred children, teenagers, and adults. For about $7 a month the students learn theory, reading, sight-singing, and piano, among other things. She has also reintroduced the inanga, a traditional lyre-like instrument that has fallen by the wayside in Rwanda, as has most of the traditional music. Carved from a single piece of wood, it is tuned a bit like a guitar, one of the eight strings plucking the accompaniment to mordent old African melodies. It is positioned across the lap, takes the shape of a small canoe, and is difficult to play. Only a handful of people still know and can play the repertoire. One of them is now seventy-nine (one of the oldest citizens of nearby Gitarama) and has been teaching this instrument to his daughter, Sophie, since she was five years old. She now teaches the inanga at the conservatory, where interest in the instrument is blossoming. 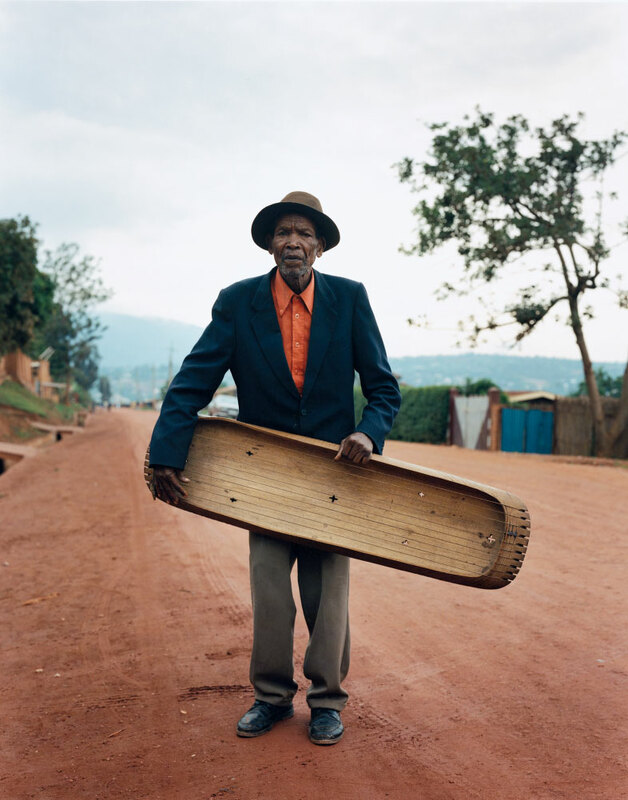 Rwandans like to say that they do not play music, they are music. Their instruments characterize the elements of fire, water, earth, and wind. In Rwanda, the traditional music is associated with the dance, ikinimba, which dramatizes the country’s proud history, choreographing the feats of kings, warriors, and heroes, and retelling the tales and legends of its people. It is an important source as there is almost no written history of the culture. In the current climate of reconciliation, where the sidewalk is shared by victim and perpetrator, the brave attempt to move on and the winding, subversive contours of shame and grief threaten to erase this also. Sophie has agreed to perform on the inanga for the concert at the Mille Collines and on this day gives a preview to the gathered student audience. She sings a typical Rwandan song, many of which are tributes to the beauty of a cow, a symbol of wealth and prosperity, or meditations on the phantasm of a star. Sophie sits at the front of the room and lays the inanga on her lap. She seems to sing to another world. There is a surprisingly bland melancholy to her voice, and her eyes have sunk into a deaf stare. The melody she sings repeats over and over, circling around the same narrow intervals. I listen to this music hypnotized, hung between a sky I’ve never seen and a ground that is no longer firm. In the stillness of the song, the inanga strums a constant lilting rhythm, like liquid from a stream. Some of the older students at the conservatory are advanced enough to have become teachers, but none have ever been exposed to the mastery of a great pianist. When Rena Sharon sits at the keyboard in the stony conservatory, the kids listen with an attention that is almost audible. They have never seen hands fly up and down a keyboard at that speed or heard piano playing so delicate. They have never been swept by the wave of a musical phrase and then shipwrecked on a beach of private daydreams. Slowly their hands unfold and their perfect postures relax. Sharon plays Barber, Debussy, and Gershwin, but above all Bach, with such expressive clarity that I feel that I am hearing this music for the first time too. In Rwanda, it is not just the performer who is on trial. It is also the composer. Young music student Juliete Erasmia Mpano. One of the ways to think about music is that it reflects the structure of basic thought—a process that synthesizes intellectual, emotional, and sensory experience. Inasmuch as music mirrors patterns of thought, it can serve as a kind of X-ray of our interior dialogue and illuminate ways in which we create meaning. Harmony-based music, like classical or popular music, is built horizontally in sequences of tension to release, conflict to resolution, doubt to certainty. The music progresses like a narrative, through linear time, to a conclusion. Some music, like some storytelling, is more predictable because the grammar of the harmony is more familiar. And even when the harmony is alien we unconsciously process its meaning because of the nature of resolution and because of its progression through time. On the other hand, rhythm-based music, like traditional African drum music, is not structured around resolution. It is built vertically in repeated patterns of rhythm and melody layered on top of each other with increasing complexity and tension to form an organic whole. It is sustained in a kind of continuous present and expresses a spiritual and sacred relationship to the natural world. The music doesn’t aim to resolve, does not drive to a conclusion. It doesn’t end. It just stops. There is a woman in Kigali who pushes a bicycle up a mountain every day. She is barefoot in the rain, and on her bicycle, soaked and mud-scarred, a passenger carries a load of goods. She walks bent forward and unavailable. When she sees me drive by in a car, she averts her eyes. I see her very clearly, though, and her image lingers in my mind in a constant, irrepressible echo. Her task seems impossible to me—Sisyphean. I can’t imagine how she continues or what she is thinking. But gradually I realize that there are different modes of thought and perception, different experiences of life, and liken them to the differences in the structures of harmony- and rhythm-based music. I begin to understand that the relationship to time, to value, to purpose, to ourselves—our basic existential tooling—is not a god-given inheritance but is, like music, a cultural construction. And this leaves me profoundly confused, dangling between two great fictions of existence: mine, in which there is no meaning without resolution, and hers, in which the idea of resolution has no meaning. Aside from coffee, tea, tin ore, hides, and a few other natural resources, there are limited exports from Rwanda. The Troupe Culturelle Imena, a traditional dance, choral, and drum ensemble, is an exception. It is one of the only cultural exchanges from the country and has graced the stages of Europe and Africa. I was invited to a rehearsal at the group’s studio in the Greenwich Village of Kigali. Social class can to some extent be identified in Kigali through the geography of the city—the higher up on the hill, the richer. The wealthiest people tend to live at the top of the crests, and many of their homes have protective, unspoiled views. Fabulous terraces overlook a serenade of nature without the compromise of the clawing human wrestle just below it. Nyamirambo is a lower- to middle-class district and is located near the bottom of the swing in the valley. It is now the desired neighbourhood for students and a young, growing middle class, but it shares its borders with the less fortunate. The city is remarkably safe, as is the country as a whole. Rwanda also has one of the most balanced legislatures in the world—49 percent of the people in the Rwandan parliament are women. Nyamirambo has areas of decent housing and accommodation. It is also one of the shopping spots in the city, and its streets are lined with outdoor food stalls and retail stores. There is an inordinate number of hairdressing “saloons.” But along the main street, mostly what is for sale are useless donated items. Artless displays in unlit stone shops of 1980s Italian-style gym outfits complete with mesh, nylon to sweat in, and tassels; T-shirts with big happy announcements in English; used can openers; dumps of old shoes. Bumper to bumper dirt. Much of the merchandise lies in piles on the ground. The studio in Nyamirambo for the Imena company is in the reverberant conference room of a church. Thirty-five drummers, singers, and dancers re-enact the folklore of Rwanda, from the bucolic “Dance of the Elephants” to the remarkably violent beats of an ancient war call. 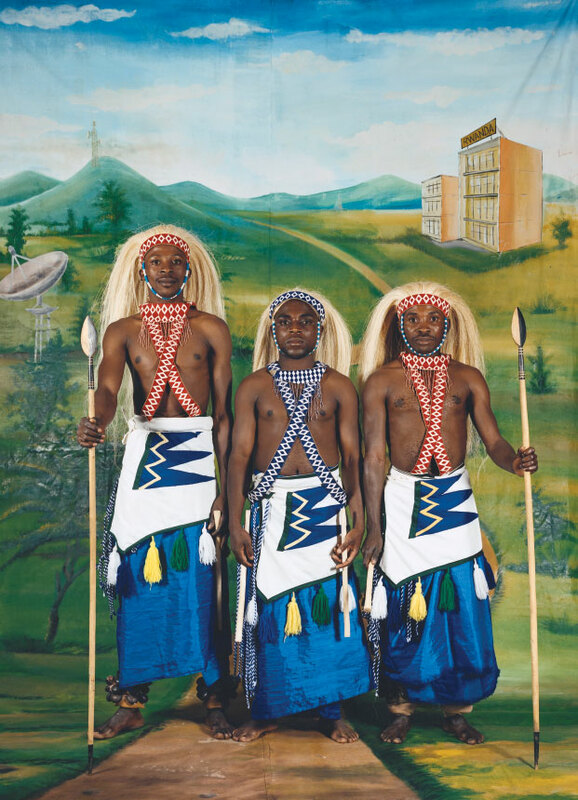 Stripped to the waist, in elaborate straw headdresses and painted in bold stripes of red, yellow, and green, the men hammer out a complex harmony of intores rhythms. (“Intores” means war, and is also the name of the local brand of cigarette.) Drums were often used like telegraphs, but these beats don’t serve to signal so much as they inject the listener with their temper and spirit. Pitched at the edge of high volume, it is an alarmingly effective performance. When the women perform a dance to the harvest there is not a hint of the “Oh God, I’m gorgeous” of a ballet dancer as they move like the rhythm of water to the hums and murmurs of an ancestral chant. Two dancers and a drummer. The Mille Collines has transformed its most corporate room into a house of music with seating, flowers, a stage, and a piano for the concert. The event has attracted about 400 people. Many are diplomats and NGO staff working in Kigali, but there are also local residents. Among them is Joseph. Slim and tender-eyed, he looks younger than his thirty years. He is the assistant administrator of the conservatory and will play a short piano piece. There are very few chances to perform publicly in Rwanda, and after only three years of lessons, though he can play Beethoven’s Für Elise competently and read music, Joseph is nervous. He manages to contain a racing pulse and grinding stomach, and with his usual modest formality slips through the fizz in the room, unnoticed. When Marlene first met him a few years ago he had been out of work for a long time. Though he studied to be an electronics technician, he was being employed at a gas station for $60 a month, supporting his mother and five siblings. Many households in Rwanda are headed by children, some as young as fourteen, but all of them have been forced to write the same autobiography. All of them live with the punishments of survival. “I live for music,” Joseph says. “It gives me life.” He now makes his home right at the conservatory and for $200 a month helps administrate and teach. There are only a few keyboards on which the students can practise. Many of the kids want to learn jazz, the violin, and the guitar, but there are few instruments and no teachers. For the concert, Sharon has programmed a sweep of nineteenth- and twentieth-century European and American music—an easy mix of lyricism, pianism, and old-fashioned American buzz. She is also introducing the work of contemporary Canadian composers Alexina Louie, Imant Raminsh, and David Gordon Duke. Before each piece she talks about what the music means to her and the images it inspires. When she says “my heart flies with the larks” before the Rachmaninov, there is an audible response from the audience, the reference so immediate, the sensibility so familiar. The concert has no intermission, but at different points Sophie, Joseph, and two other conservatory students take the stage. For the last piece, however, Sharon leaves the podium and does not introduce what she is going to play. Onstage, four drummers assemble behind the piano. Rugano, the soloist, dressed in full war regalia, walks to centre stage and positions himself behind his large Ugandan drum. The two sticks he’s holding handle like spears in his hands, and his thick, condensed body is as ripe and oiled as a boxer’s. The group is about to perform a Bach D-minor concerto, originally written for clavier and string orchestra but in tonight’s version scored for piano and African drums. At the rehearsal in the afternoon it was decided that the ensemble of four would drum only with their hands and begin playing at the recapitulation, midway through the concerto. Rugano, however, would play through the entire piece and alternate between hand and stick. He doesn’t speak English or French but quickly understood the text of the music. The drummers communicated with their eyes and ears and followed Sharon with the instincts of jazzers. Bach is particularly well suited to this marriage—the narrative and rhythmic elements in his music are so logically integrated. Though the rehearsal went smoothly, it wasn’t clear this experiment wasn’t an exercise in bad taste, or worse, misplaced colonial-style goodwill. While it’s true bringing together the two types of music isn’t new, the updating of Bach had been in the West, with his music spinning into countless jazz improvisations and inspiring classical contemporary composers. There was also the general concern that the performance itself could fail—missed cues, fractured concentration, red-faced panic, all the usual nightmares. But the D-minor concerto needs reinforcement to be really effective, and in the absence of other instrumentalists, the idea took root. Besides, what’s a finale without a little risky panache? Sharon now takes her seat at the piano. she settles onto the stool and silently, expertly, relaxes, imperceptibly dropping her jaw and directing whatever tension she feels into her lower body. The music has already begun for her, though her hands have not touched a key. She looks over at the drummers and nods to Rugano, who is crouched over his drum—head cocked forward, eyes stiff and small. She takes a breath, puts her hands on the piano, and the music sounds. The tempo is brisk, very brisk, in keeping with the muscular nobility of the theme. After the opening statement, Rugano comes in, first beating every strong beat, then off beats, and gradually moving into increasingly complicated animations of Bach’s rhythms. Periodically he looks at Sharon, whose eyes never leave him. As the piece progresses, her gestures direct his dynamics. At a certain point she indicates that he come down, that he beat with his hands as the music enters the long harmonic sequence that will culminate in a heroic return to D minor. Rugano puts down his sticks and cradles his ear over the drum. The room goes to pianissimo. Sharon can suddenly hear elements in Bach’s music that she has never addressed. The passage gets a new rhythmic attention from her, and you can tell it excites her. She smiles at Rugano, who is now guiding her like a great lover. Unseen by the audience, at the back of the hall, two costumed and painted dancers with bells tied around their ankles begin their advance down the aisles. They move with the fluency of serpents, in perfectly synchronized movements. When they arrive at the head of the stage and turn to face the audience, they never stop their undulating sway, their centre of gravity as if from under the ground. The four drummers now enter the fray, picking out patterns of rhythm that open an unseen life in Bach’s imagination. The music steams into the room and the listeners, rapt in anticipation, bend forward in their seats. When the piece is over, the hall erupts into wild, foot-stamping applause. I left Rwanda reluctantly. Twelve days is not enough time to get more than an impression of such a complicated country or manage the blurs of travelling. Rwanda is in a state of transition and reconstruction. The huge continental divide seems to be narrowing through confluences of culture, so perfectly illustrated at the concert, but also in other ways and other sectors. There is a strong desire to put the past behind and great efforts are being made to modernize, but in the welcome of other influences comes the necessary confusion of identity. Oddly, it is what I am feeling months later. Though many of the sharp tastes of my trip to Rwanda have faded, one image remains clear and unaltered. It is the picture of the woman on her bicycle. Months later, I am still suspended. Months later, I still hear her echo.